Before we go any further, we need to define what passive income actually is. Some great people would call having a blog or knowledge commerce business a passive income, but I don’t quite see it like this. Although setting up a blog or creating a e-course can be a fantastic way to earn more income, they do require some work up-front and also on an on-going basis. Although you can automate parts of your blog or e-course business later on, there will usually be a lot of work up-front and some involvement on an on-going basis, even if just for a few hours a week. As such, I classify these things as side hustles – projects that you can do on the side to earn additional income. That’s not to say that you can’t scale your side hustle over time to give you all the income you need, but that’s not the topic of todays post. 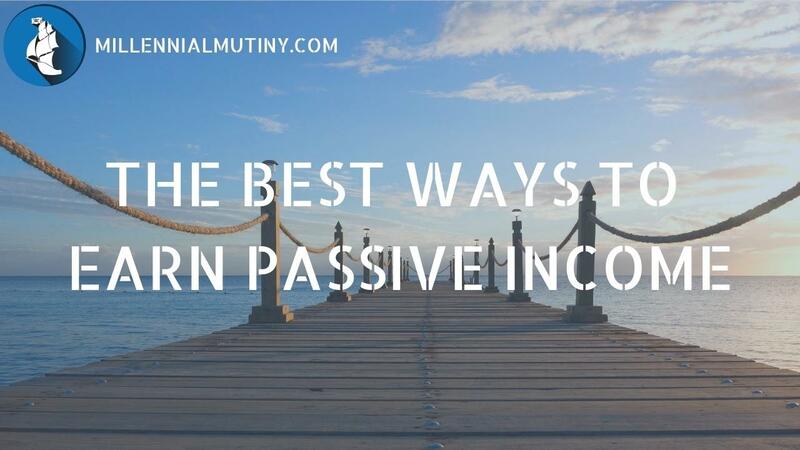 No – today we are going to talk about how to generate passive income. For simplicity, I am going to classify passive income as income that is generated 24/7 either with zero involvement from you, or if any work is required, this is less than 30 minutes a week. If it involves any more than 30 minutes work a week, I would call it a side hustle and we will cover all the great side hustle options in another post. In order to generate truly passive income, you will generally need some savings or capital to invest in the first place. If you don’t have any money, you will struggle to find something to pay you passive income for nothing. In most cases, to generate truly passive income, you will need to invest some money up-front which will then generate a return for you over time. You can choose to ‘collect’ the returns that your investment generates and live from the income, or you can usually choose to re-invest the proceeds which will generate more income in the future. Investing in the stock market does not have to be scary or complicated. Many people mistakenly think that they need to have loads of spare cash or insider information to get started, which couldn’t be further from the truth. Now that we have online brokerage accounts and so called ‘robo advisers’, it can be really simple to invest and you don’t need much to get started. Some accounts will allow you to get going with as little as $100! Stocks can be a great way to generate passive income. You can find individual shares that will give you a yield of 4%, 5% and even up to 8% or 9% (warning – if a stock has a yield this high, it is probably either very high risk or the yield is unsustainable – proceed with caution). If you are total newbie to investing, I would suggest you go for a simple, low-cost tracker fund. This really is the definition of passive investing. Now – when it comes to stocks, not all funds are created equal. We are looking to generate passive income here, so we want to focus on income producing stocks. The good news is, you can now buy low-cost index funds from the likes of Vanguard and Blackrock. These funds do all the hard work for you – they buy all the stocks and keep your portfolio in balance so you don’t have to lift a finger. All you have to do is wait for the income stream to start flowing in – simple! If you are a little more experienced at investing, you might want to pick your own individual funds, rather than selecting an all-in-one fund like the ones above. If you are choosing individual income funds, you should be careful to spread your investments over a number of different types of shares and across different parts of the world. You can build a fund portfolio with Hargreaves Lansdown in the UK or Fidelity in the US. If you are a real investing pro, you may want to build a portfolio of individual income paying shares. You will know if this option is right for you, so I won’t say any more here. Investing in real estate can be a great way to earn passive income. Many of my clients in the Financial Planning business have built up seven and eight figure portfolios in property because of the sometimes impressive rental yields and possible capital growth on offer. In order for a real estate investment to be passive, you will need to be careful with the groundwork. If you want as little involvement as possible, it pays to buy a newer property because there is likely to be less work and maintenance (the downside of this being that there is probably not much scope to add value by renovating the property). You will also need to appoint a managing agent, otherwise you will end up getting calls from your tenants in the middle of the night because there is a leak in the roof – not exactly what I would call passive. The other downside with real estate investment is that you often need a large sum of money to get started. Unlike stock investing, where you can get started with $100, you may need $25,000, $50,000 or even $100,000 to get started with real estate investing. There are also some property crowdfunding sites that allow you to invest into a part of a property with other investors. These are fairly new and untested so if you do feel that this option is attractive, perhaps best to only invest a small amount to start with. Finally, you may also need to take on a mortgage. Some people are happy with this, but others want to be completely debt free, which is awesome. Whatever route you take, be sure to do your research and always check what your NET rental yield will be after you have deducted taxes, interest on and debt and the likely costs of running the property. Although if you buy stocks, you are ‘technically’ investing into someone else’s business, these are generally huge multi-billion dollar companies. What I am talking about here is investing in a small or start up business and taking an equity stake, so you own some of the business. This can be a brilliant way to earn a passive income – you provide the money, while someone else does all the work. Because you are an equity partner in the business, you get a share of any payouts and hopefully some capital growth as well. Investing into small start-ups can be very risky however, so you should always do your research and make sure you only invest what you can afford to lose. That’s not to say that you have to invest loads of money in this type of venture. Perhaps your friend just needs $1,000 to buy stock for their online store or your brother in law needs $2,500 to fund some advertising for his dating agency? If you keep your eyes open, there are opportunities to be a sleeping partner in all sorts of businesses. If you are planning a trip, then your home is going to be sitting empty while you are away. So long as you don’t mind someone else staying at your place, then why not rent your property out on Airbnb while you are away? This can be a great way of earning some passive income. Just hand the keys over when you leave for your trip and collect the cheque when you get back! The only thing you may need to do is arrange a cleaner for before you get back – this is supposed to be passive income after all. Although this is probably not going to generate a life-changing amount of income, a cashback credit card can easily give you an extra $100 - $300 a year. This really is the definition of passive income – spend money on your cashback credit card exactly like you would anyway and then get paid at the end of the year – brilliant! A cashback credit card is also one of the best examples of ‘good debt’. So long as it is used responsibly and you pay it back each month, you are basically being paid to spend money you were going to spend anyway. Just be sure that you don't spend more than you would do otherwise. If you end up spending extra money just because you have a cash back credit card - that totally eliminates the point of having one. If you are not disciplined with your spending, probably better to have no credit card at all! Similar to cashback credit cards, cashback sites allow you to earn money on purchases you were going to make any way. You simply click on the link in the cashback site and then go to Amazon or any other website to finish your purchase and you get a percentage of the purchase price back – easy! My favourite cashback sites are Top Cashback for UK shopping and Ebates for the US. So there we have it. Some great ways to earn income while you sleep (or at least while you do what you were going to do anyway). Stay tuned for a mega post on a ton of different side hustle business ideas.